This epoch-making product with an English label was launched in 1964 on the very same day as the opening ceremony of the Tokyo Olympics. At the time, the standard for sake was an Isshobin, a 1.8L bottle. And, the container embodied the face of the brewer. Hence, packaging was everything so the brilliant idea of sake in a ready-to-use glass cup was born. The novel blue label was eye-catching. The design was the brainchild of Iwataro Koike, a professor at Tokyo University of the Arts and Joji Matsukawa, a professor at Joshibi University of Art and Design. This same label is used today. Since the product was sold in Tokyo Station and elsewhere, consumers liked the idea of being able to enjoy it on the train which increased sales. 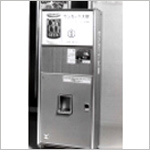 In addition, the first vending machines to sell alcohol were introduced in 1967. Year after year, publicity increased the share of One CUP sales at Ozeki as its popularity took off, it sold for 100 yen from 1966 to 1969. Several TV commercials were developed to leave an impression which led to a Clio Award. One CUP came off as youthful and convenient in commercials through employing movie stars, using sets from historical dramas, creating a travel series and shooting overseas. Other brewers followed suit by launching similar products, so Ozeki drove home the point that ‘One CUP means Ozeki’. In 1973, One CUP was recognized with an honorable mention at the Package Show. Realizing that the round bottle acted like a lens, Ozeki printed color photos of Japanese scenery and festivals on the backside of the label to help set the mood for drinking sake. In 1972, Ozeki registered the ‘One CUP’ logo design as a trademark. In 1979, sales topped 100 million cups, as 300,000 cups of this hit product were consumed daily. The Brewing Society of Japan conferred upon One CUP the Yahachiro Ishikawa Award for its contribution to popularizing sake. The One CUP trademark became synonymous with Ozeki. Since One CUP was first launched, the lid has been improved four times. Even today, Ozeki continues to revisit the design with the theme of making the product ‘easy to drink’. As time goes by and changes are made, something new is always being discovered. The spirit of One CUP Ozeki lives on today and keeps expanding globally in the 21st century.